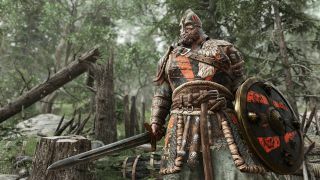 For Honor wants you to "discover what your inner warrior is like"
This new video on the origins of For Honor is short on in-game action but does feature creative director (and possible viking) Jason VandenBerghe talking about his beliefs that form the core of the game: that "combat is an art form", and that each of us has an inner warrior that represents our values. If you value skill, mastery, and honour, you're a samurai. Vikings value freedom, enthusiasm, and celebration. And if you're a fan of culture, defence, and nobility, then your inner warrior is a knight. All disciplines seem to share the inner value that enjoys hitting people in battle. Producer Stephane Cardin says that in its three years of development For Honor's team has grown from 12 to more than 150 people, so it should be a pretty big game by the time it comes out next year. Skip to the four minute mark to get straight to the part that tells you how the game will play.